BH is for Be Happy! | All Around Dogs BH is for Be Happy! | Thoughts on training and life with dogs. BH is for Be Happy! On September 20th Delta and I attended the USABOX IPO National, hosted by the New England Boxer Klub in Connecticut. We entered in and earned our BH, my first title in IPO. The title is meant as a temperament test prior to competing for the higher level titles which include a protection phase. It consists of a written exam (for first timers, to make sure we know the rules), an obedience routine, and a “traffic” test which is similar to the AKC Canine Good Citizen test. This did not happen at all the way I imagined. Earlier this year, I was saying that I wouldn’t go into the ring until Delta could perform at a high level and I wouldn’t let a trial dictate my timeline. But then I had the opportunity to compete at the USABOX IPO Championship, being held just 3 hours away. And my good friend, Jill, wanted me to enter so we could earn our BHs together. A month of random and, thankfully, minor health issues with Delta meant that we were not nearly as ready as I had planned. So I decided to take my own advice – keep in mind how to NQ and committing to embrace the awkward. If we couldn’t be polished when we stepped on to the field for our obedience routine, then I was damn well going to make it a learning opportunity for me and a positive experience for her. It was one of those times where I knew our “best case” was not going to happen as soon as I got out on the field. 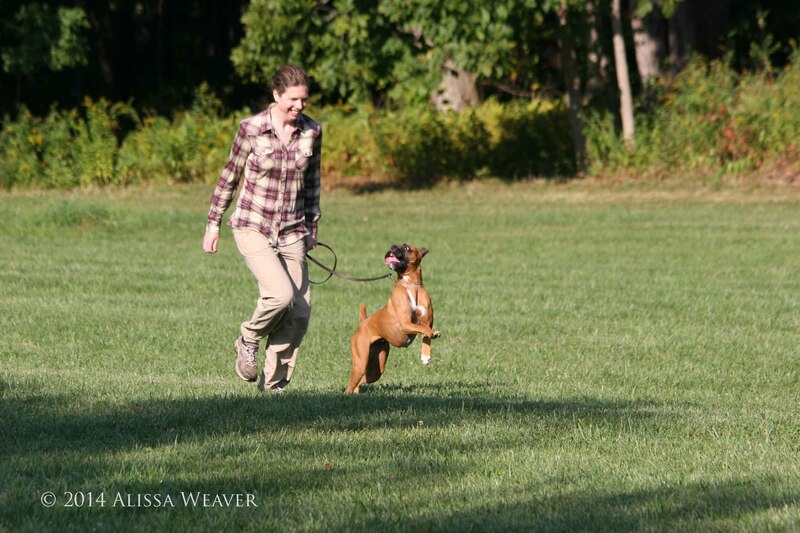 We were going second, which meant we’d be doing the down under distraction (similar to AKC honor exercise) while Jill and her boy, Strummer, completed their exercises. I was glad to start out with an exercise I knew would be successful, but spending 6 minutes not facing each other is not a great way to stay connected. Delta’s attention was so-so at best when we set up for the heel on leash. We were OK for the first leg of the pattern, until she noticed Strummer in his down. I had to execute a leash-propelled about turn and I became painfully aware that I was being watched by a crowd of mostly strangers. I started to worry, until I hit the fast pace. Watching my girl bounce (mostly) beside me pushed those thoughts away and put a smile on my face. I was still aware of being watched, but my focus went back where it belonged – Delta. I knew I was going to be giving multiple commands but I also wasn’t going to nag her. I challenge you to look at that face without smiling. 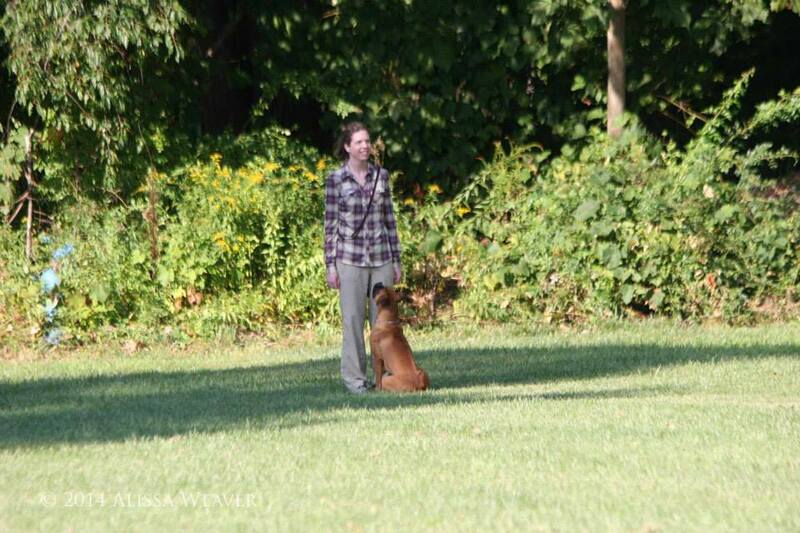 By the time we reached the off leash heeling, my goal was simply to keep her nearby. During the “group”, she became temporarily attached to a man’s pant leg (to be fair, 3 out of 4 BH dogs sniffed him, he swears he was not harboring bacon). But I got her back. Before we hit the about turn, she had become very aware of her freedom. After a bouncing detour, I got her back. The fast was too much for her and she ran some goofy circles around me. I tensed up for a moment and called her sharply. She went faster. I called her to front, had her finish. I got her back. She found a fascinating smell on the last leg of heeling. I got her back. The sit out of motion was a little freestyle, but she sat and stayed while I walked away and returned to her. Ending with a bang – into my shins. In the end, I met my goals. Delta had fun, so much so that the judge complimented her happy disposition. It was a learning experience for me. I learned that things can fall apart in front of strangers without me melting down. Even if she does a little sightseeing, my girl comes back to me. And that we can completely blow an exercise and still come out smiling. You made it all the way through the post? You earned the right to see this in all its glory.